Audiologists Mary Gamble and Lisette Jackson of Otolaryngology Specialists of North Texas are highly experienced and uniquely qualified to identify a wide variety of pathology and underlying medical conditions of the hearing and balance systems. They enjoy a close professional relationship with our Ear, Nose, Throat and Sinus specialists, Dr. Rohn and Dr. Gamble, to whom they refer cases for appropriate medical or surgical treatment. Audiology is the branch of science which studies hearing and balance disorders. It was born to address the hearing needs of World War II veterans due to the noise induced hearing loss many of them sustained during the war. Audiologists have training across many disciplines including anatomy, physiology, auditory electrophysiology, acoustics, psychophysics, neurology, and psychology. Audiologists have undergone extensive training at certified audiology programs, graduating with a 6-year Master’s (MS or MA), a Doctor of Audiology (AuD) or PhD degree. Our audiologists have extensive medical experience and provide comprehensive care, unlike stand-alone hearing aid centers that just sell hearing aids. Please give us a call if you feel you are suffering from hearing or balance problems. Hearing is active throughout the entire day and cannot be “turned off”. All day long we pick up sounds from our environment. Some of these sounds are crucial, such as conversations or warning signals, while others fade into the background, such as traffic noise or ticking clocks. The human brain is constantly filtering through these sounds to determine which you should attend to and which you should ignore. Hearing begins with the outer ear collecting sounds with the specialized “funnel” shape of our ears. This sound is then directed down our ear canal to a thin membrane called the tympanic membrane (eardrum), which separates the outer ear from the middle ear. The middle ear is air-filled, and the pressure of this space is regulated by the Eustachian tube, which connects the middle ear space with the back of the throat. The Eustachian tube opens when the pressure between the middle ear space and our environment is not equal, such as during a flight, traveling in mountainous areas or scuba diving. 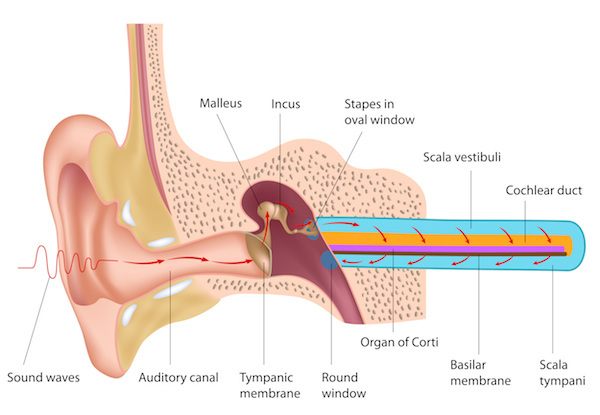 The tympanic membrane is set into motion by sound pressure waves hitting it. The first of the three middle ear ossicles (bones) is attached to the center of the tympanic membrane. When the membrane starts to move, it sets the ossicles into motion as well. The malleus (hammer), incus (anvil) and stapes (stirrup) form a bridge to the inner ear. The inner ear is encased in the bony portion of our skull and contains the delicate hearing and balance organs. The hearing organ is called the cochlea and is an amazing structure filled with thousands of sensory hair cells that send neural impulses to the brain via the auditory nerve. The hair cells are organized by pitch along the cochlea, just like the keys on a piano. This allows humans to hear sounds at various pitches and loudness levels. The balance organ is also in the inner ear. Read more about Evaluating Balance Function. The ability to hear and understand is an essential part of our everyday activities and quality of life. Globally, hearing loss affects about 10% of the population to some degree. It is one of the most common medical conditions presenting to physicians. 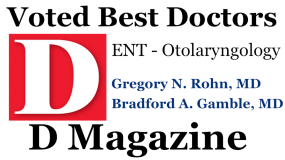 The Physicians and Audiologists at Otolaryngology Specialists of North Texas are experts in the diagnosis and treatment of hearing loss. Our audiologists frequently encounter challenging medical causes of hearing loss and are well versed in medical audiology. Your testing will be efficient, accurate and completed in one of our state of the art facilities. Whether the treatment is a complicated surgery, simple tympanostomy ear tubes (BMT) or hearing aids, it all begins with accurate testing. You are in good hands with our experienced professionals. Hearing loss is a partial or total inability to hear. In children, it may affect the development of language, while in adults, it can cause social or work related difficulties. Hearing testing is used to determine the severity of the hearing loss. While the results are expressed in decibels, hearing loss is usually described as mild, moderate, moderately severe, severe, or profound. Another aspect of hearing testing involves assessing the perceived clarity of a sound rather than its volume. Our audiologists use advanced, recorded speech stimuli to assess one’s ability to understand speech, which is an important aspect of your hearing ability. Our audiology labs are equipped to test infants, individuals with special needs and adults with our various diagnostic equipment and procedures. Sensorineural hearing loss is a type of hearing loss in which the root cause lies in the vestibulocochlear nerve, the inner ear, or central processing centers of the brain. The majority of human sensorineural hearing loss is caused by abnormalities in the hair cells of the cochlea. The hair cells may be abnormal at birth or damaged during the lifetime of an individual. There are both external causes of damage, like noise trauma and infection, and intrinsic abnormalities, like deafness genes. This type of hearing loss can be caused by prolonged exposure to very loud noise, for example, being in a loud workplace without hearing protection, or firing weapons. This is also the type of loss associated with aging (presbycusis). Conductive hearing loss is a type of hearing loss where the cochlea or inner ear is functioning normally but the pathway leading to the cochlea is disrupted in some way. The most common type of conductive hearing loss is due to otitis media (middle ear infection). The fluid affects the movement of the eardrum and the bones of the middle ear. This dampens the energy traveling through the system and makes things sound muffled. Anything affecting the eardrum or middle ear system can lead to a conductive hearing loss and includes; eardrum perforations, thickening of the eardrum (tympanosclerosis), disarticulation of the middle ear ossicles (bones), fixation of the ossicles (otosclerosis), a mass in the middle ear space (cholesteatoma), and missing ossicles. The wonderful thing about a conductive hearing loss is that the root cause can generally be treated with medication, surgery or amplification with near complete restoration of hearing ability. Mixed hearing loss is a type of hearing loss where there is both sensorineural and conductive loss present. An example of this loss would be a patient who has “old age hearing loss” along with an eardrum perforation. Mild Hearing Loss (25 dBHL to 40 dBHL): Difficulty hearing soft speech in some conversations, which is worsened in any background noise or group settings. Moderate Hearing Loss (40 dBHL to 55 dBHL): Hearing of soft speech is limited and conversational speech is nearly impossible to understand in the presence of background noise. TV, radio and telephone volumes are noticeable increased. Hearing aids are typically recommended. Moderately to Severe Hearing Loss (55 dBHL to 70 dBHL): Soft speech is not audible and conversations must be significantly increased in volume in order to understand. Hearing aids are highly recommended. Severe Hearing Loss (70 dBHL to 90 dBHL): Normal conversation is not heard. This loss is generally apparent to family and friends. Hearing aids are required to hear speech. Profound Hearing Loss (90 dBHL +/-): Unable to clearly understand even amplified speech. Candidate for cochlear implantation. Does loud noise cause severe hearing loss? What about medical conditions? Listed below are causes and symptoms of the problem. Hearing loss can be inherited and may be syndromic or nonsyndromic. Syndromic hearing loss occurs when an individual presents with other medical problems aside from deafness. This accounts for around 30% of genetic hearing loss. Syndromic cases occur with diseases such as Usher syndrome, Waardenburg syndrome, Alport syndrome, and Neurofibromatosis type 2. These are diseases where deafness is a symptom or a common feature. Nonsyndromic hearing loss occurs when hearing loss is the only symptom. These disorders account for the vast majority of hereditary hearing loss. The progressive loss of one’s ability to hear high frequencies with increasing age is known as presbycusis. This begins in early adulthood, but does not usually interfere with the ability to understand conversation until much later. Most severe cases of presbycusis are inherited. Although not pleasant, it is a normal aspect of aging and can be effectively treated with hearing aids. Our audiologists are experts at fitting hearing aids and do an excellent job of helping people transition back into the world of “normal hearing”. Noise is the cause of approximately half of all cases of hearing loss. Noise-induced hearing loss (NIHL) is typically centered at 3000 or 4000 Hz (treble range). Damage can occur suddenly in response to an extremely loud noise event (blast or explosion) or can progress slowly over time with chronic exposure. As noise induced hearing loss progresses, damage spreads to the lower frequencies. The damage occurs to the sensory hair cells within the inner ear, or cochlea, when exposed to very loud sounds. The inner hair cells cannot be repaired or regenerate resulting in permanent hearing loss. This damage often leads to tinnitus as well. Many people are unaware of the presence of environmental sound at damaging levels, or of the level at which sound becomes harmful. The EPA has identified the level of 70 dB(A) for 24 hour exposure as the level necessary to protect the public from hearing loss and other disruptive effects from noise, such as sleep disturbance or stress-related problems. Common sources of damaging noise levels include car stereos, children’s toys, transportation, crowds, lawn equipment, power tools, gun use, and even hair dryer. In the USA, 12.5% of children aged 6–19 years have permanent hearing damage from excessive noise exposure. This type of hearing loss is entirely avoidable by limiting exposure to noise or using appropriate hearing protection. The audiologists at Otolaryngology Specialists of North Texas are well versed in the varied options for hearing protective devices and can fit you with a comfortable device to protect your hearing. There are many illnesses which can cause hearing loss including the following; inner ear fluid imbalances, viral infections, measles, meningitis, autoimmune disease, fetal alcohol syndrome, premature birth, syphilis, otosclerosis, brain tumors, superior canal dehiscence, and otitis media. The hearing loss may be permanent, temporary or reversible depending upon the cause and specific treatments. In addition to medications, hearing loss can also result from specific drugs, metals, solvents, and asphyxiants. Hearing loss due to chemicals starts in the high frequency range and is generally irreversible. It damages the cochlea with lesions and degrades central portions of the auditory system. Some types of chemotherapy medications (the platinum groups) can cause permanent hearing loss, but if monitored appropriately by an Audiologist and Oncologist, the effects may be limited. There can be damage either to the ear itself or to the brain centers that process the auditory information. People who sustain head injury are especially vulnerable to hearing loss or tinnitus, either temporary or permanent. 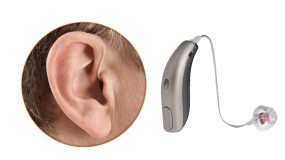 Read more about hearing loss evaluation and hearing loss treatment with hearing aids and other specialized devices. 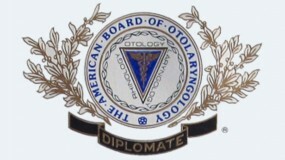 Audiologists, Mary Gamble and Lisette Jackson, and otolaryngologists, Dr. Rohn and Dr. Gamble of Otolaryngology Specialists of North Texas are highly experienced and uniquely qualified to identify a wide variety of pathology and underlying medical conditions of the hearing and balance systems. If you would like to schedule an appointment with our office, please call our Plano office at 972-378-0633 or Dallas office at 214-239-1641.